The AIAS institutional visit to the new CIDETEC Surface Engineering installations took place last 25 October. Josep M. Simó, AIAS president, Alicia Bosch, the president of the Centre Metal·lúrgic and Elvira Martín, AIAS executive secretary, were present. AIAS – the Association of Surface Finish Industries (Asociación de Industrias de Acabados de Superficies), based in Sabadell (Barcelona), is an entity composed of Spanish companies in the metal and plastic processing and veneering sector, active since 1982. AIAS also groups together manufacturers, distributors, consultants, environmental managers, software providers and technological centres. 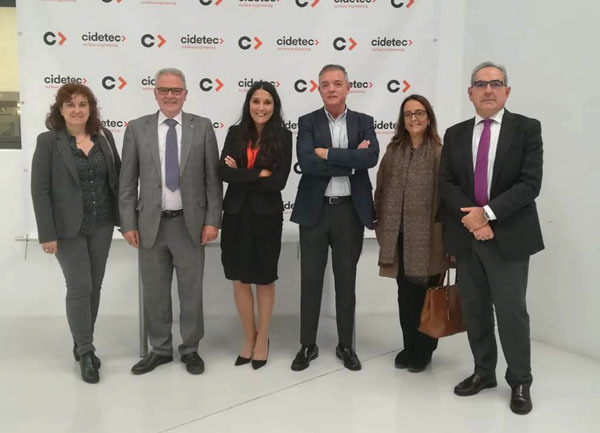 Following the tour and the visit to the new installations, aspects relating to the present and future of the surface treatment sector in Spain were analysed, and ties between both organisations were strengthened, enabling the companies in the sector to align themselves with European directives and the new challenges posed to Industry 4.0.